Did you know that watermelon is 92% water? No wonder it’s so refreshing! People have been digging into this tasty, juicy fruit for millennia, and it all started in Ancient Egypt. It’s said that watermelon cultivation began in the Nile Valley as early as the second millennium B.C. Watermelon seeds were even found in King Tut’s tomb! On Aug. 3, we celebrate this ancient berry in a feast of juicy deliciousness—otherwise known as National Watermelon Day. Watermelons are 92% water. But what if you replaced some of that water with... vodka? Organize a boozy celebration with your friends by cutting a hole in a watermelon, inserting a funnel, and pouring in some vodka. The rest is... Well, you probably won't remember the rest. It's no surprise watermelons are in the same family as the pumpkin—you can carve them, too! Unleash your creativity by carving a watermelon rose, a watermelon shark, or a watermelon basket. The options are endless. The Japanese have watermelon splitting down to an art. In the game of Suikawari (similar to a pinata, but without the candy and paper mache), players are blindfolded, spun around three times, and given the chance to crack open a watermelon with a wooden stick. But instead of candy, you get watermelon guts in your face. Did you know there are more than 1,200 varieties of watermelon in the world? They range from pink to orange, large to small, round to even square! If you ever find yourself in Japan, be sure to track down its famous cubic watermelons. Watermelons cross all produce boundaries. They are a fruit (a berry, to be precise) because they contain seeds to produce more plants. But they are also a vegetable, because they are planted from seeds and harvested like other vegetables. Watermelons are a member of the gourd family, meaning they're related to squash, cucumbers, and pumpkins. On a diet? Not to worry! 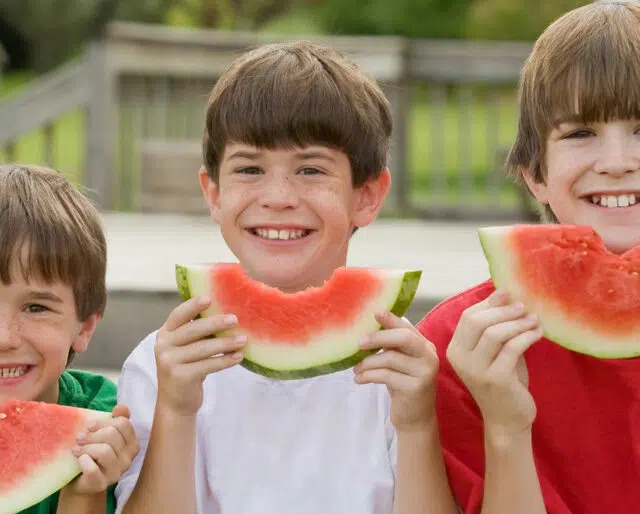 Watermelons are 92% water, so you can not only dig in without feeling guilty—you can also stay hydrated on a hot summer day.